The Galadari Hotel's fine dining restaurant, the California Grill is set ablaze to ignite its Flambe Promotion commencing 14 to 23 July from 7 p.m. to 11 p.m. The restaurant is offering a range of sumptuous hot and dessert flambes for your indulgence. 'The California Grill invites you to experience this special show cooking opportunity where our expert chefs will conjure up the most magnificent flambes just for you. The hot flambes include shoe lobster, prawn, chicken, salmon, T-bone steak and much more. The decadent dessert flambes give way to caramel, apple, pear and pineapple inspired creations. You can also taste the wondrous local fruit inspired flambes, a treat not to be missed,' says Executive Chef Imroze Salih. All flambes include accompaniments to add further gastronomic delight to the entire experience. 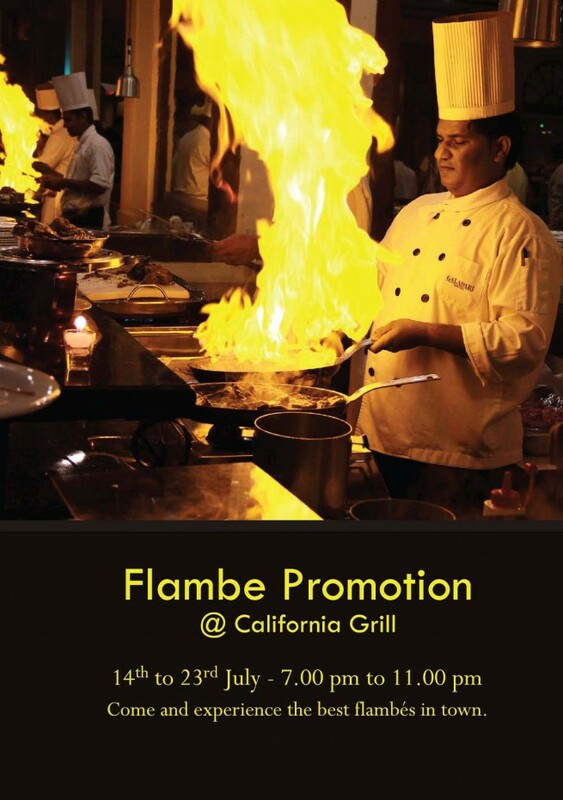 Come and be a part of this fabulous promotion, unique and unforgettable will be what the California Grill flambes promise to offer.